Just last week, Barbara Crampton paid a visit to Bilbao’s FANT festival to receive the very first ESTRELLA de FANT award in recognition of her life’s contribution to the genre film industry. SCREAM: Can you reveal your character’s role and intentions in Replace and what resonated with you when you read the script? 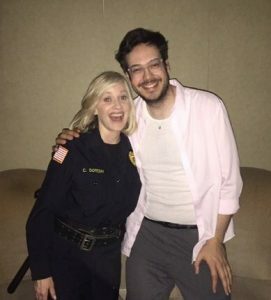 Barbara Crampton: Colin Geddes ran the Midnight Madness at the Toronto Film Festival for many years until just very recently. He is one of the producers on this movie and the part I play, who is the doctor of a girl called Kira (Rebecca Forsythe) who is losing her skin and experiencing some problems, was originally supposed to be played by a man. I think it was Colin that suggested making it a female and casting me in the role but it did actually come to me by way of another guy called Karim Hussain. He was a DP who was supposed to shoot the movie and had worked on We Are Still Here. He called me and told me that they were doing this movie and that Colin had recommended me and that the Director Norbert Keil, who lived in Germany, would like to meet me. So he came to Los Angeles, and I happened to be in LA at the time and we had a long conversation and he explained to me how he’d love for me to play this part and that’s how that happened. I was interested in taking this on because I liked him and I really liked the script and it was also co-written Richard Stanley so that also really interested me. And then they decided to shoot the movie in Munich. SCREAM: Had you ever worked in Germany before and did you find any particular differences when it came to working over there? I had never worked before in Germany. I found them to be very technical. You think of the Germans being best with automobiles and technology and with exacting sciences, right? I found them to be very exacting with where the camera was put and how they were going to film the scene and the lights and everything. And then you see the film and it’s very stylish. So there was that, but then there were a lot of special effects in the movie and because with money you have a time constraint and you want to be able to actually film the movie in a timely manner, they did all the inserts for the movie in the evening. So we would shoot during the day for 12 hours or so and then the effects crew would do all the inserts at night with hand doubles and arm doubles and things like that. Consequently, a lot of what was filmed I didn’t see because I wasn’t there. So, in answer to your question, they were the most efficient at getting the most done that they could within the time frame that we had to shoot the movie. SCREAM: The protagonist is losing her skin and concerned about her appearance. Does the film provide a cutting commentary on the important role beauty plays in today’s society? I think so. It’s really about this one character’s journey and how she wants to look young and beautiful and at what cost she would succumb to those desires and how that impacts her life and her loved ones and people that she encounters. It’s also a love story because there’s someone that falls in love with the main character. It’s a movie that really examines the female perspective and how far she will go to retain and regain her youth and beauty and to prolong that for a long period of time. I play a doctor in this movie and I did some research for it at a place called the The Buck Institute that actually happens to be where we live in Marin County. They study aging and I went and interviewed two different scientists there and they talked about prolonging life and how people will look. A lot of people today do plastic surgery or botox or collagen or whatever to retain their youth but in the doctor’s studies of any diseases like Parkinson’s or heart disease, they are finding that the by-product of these technologies they are developing is that cellular regeneration that is happening to your heart or whatever will also happen to your skin. So, looking better for longer and living longer is not science-fiction. It’s something that is happening around the corner and these scientists were telling me that it’s not going to be in the too distant future where people really are going to be able to look good and live to be 150/200 years old. We think that’s crazy but it will be normal at some point within the next century. That’s half the fun of playing a part for me too. You get to put yourself in the shoes of a different person and learn a little bit about their life and what they do. 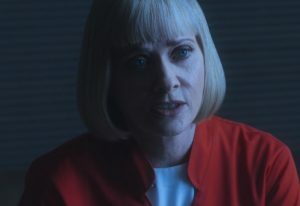 SCREAM: After researching how to stave off the aging process, was there anything you specifically took to Norbert that you thought should be highlighted or implemented in the script? I did. When I read the script, I mentioned how the scientists I did research with had told me things that were actually happening. What I just said to you about people reaching 150/200 years old wasn’t in the original script so I suggested that that should be included because what the doctor is really interested in is longevity. Maybe Kira’s character is interested in beauty but what I’m really interested in is longevity. SCREAM: Another film that I know you are really excited for people to see is Applecart. The trailer just dropped a couple of weeks ago. Can you shed a little more light on that one, especially as people are calling it “another” cabin in the woods movie but it really is something very different, right? What I will say is that it is not what you think at all. The trailer looks like a cabin in the woods movie where a family goes into the woods and some terrible things befall them and people die. That’s a very commonly used horror trope and that’s what they want you to think but there’s so much more involved in this movie and it’s not just that. It’s very layered and told from three different perspectives. One of the taglines for the movie is that perspective is everything. There’s one story that’s told but when you actually see the movie, it’s revealed from a lot of different perspectives to reveal what the real story is and what really happened and the character’s journey in the movie. It’s really quite innovative what they’ve done and I’ve seen some of the footage and it’s something I’m REALLY excited about. 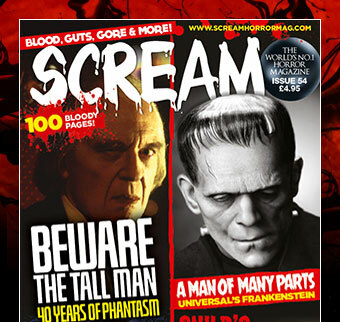 SCREAM: And you got to work alongside a lot of familiar faces in that one. Oh, it was fantastic. I’ve come to feel like Brea Grant is like a sister to me. We’ve travelled together now and shared hotel rooms at film festivals. I just think she’s a dear person and a terrific actress and I don’t think she has been given the type of role that really has been able to showcase her in a big way but I think that Applecart could be the one for her. I’m very excited, on a personal friendship level, for her with this movie. And then A.J. Bowen I met when I first came back to acting with You’re Next and he is the type of actor where you don’t know where the acting begins/ends and real life begins/ends. He is so natural and believing as an actor and he’s such a giving actor. It’s just a pleasure and a joy to work with him and we’ve become quite good friends over the past few years so to work with him was like a dream. And then, of course, I’ve been a fan of Don Coscarelli’s for many years and I happened to meet him a few years ago and I got to know him a little bit. He’s one of the producers on this film so I got to hang out with him for a couple of weeks. What could be cooler? And Brad Baruh, who wrote the script, who was also the producer on John Dies at the End is insanely talented. I loved working with him as a director. He was a pretty hands-on director and really knew what he wanted and was very specific and just a really fun, interesting and really creative guy. This is his first feature although he’s been working in the industry for a very long time doing trailers for all the really big movies that come out of Hollywood and interviewing major stars and putting together marketing for really big movies. He did an amazing job and I just can’t wait to see the finished product myself and I can’t wait to share it with all of you. SCREAM: And you’ve literally just flown straight off the set of Puppet Master: The Littlest Reich. 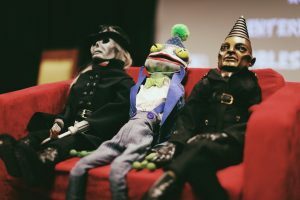 Did the fact you appeared in the original Puppet Master movie have anything to do with you getting cast in this reboot? I had a cameo in the first one. I think they brought me into The Littlest Reich specifically because I worked in ’80s movies and specifically on the original movie. The Producer on the Littlest Reich is Dallas Sonnier and he was one of the Producers and the creative driving force behind Bone Tomahawk. He loves genre movies and the Puppet Master movies were a part of his childhood that he really loved so now that he’s working as a producer, he wanted to take over the rights for the project and have his own reboot of the film. SCREAM: Something that really piqued my interest for this reboot was the fact that it’s Bone Tomahawk’s scribe, Craig Zahler, who has written the script. I’m guessing he’s taking the franchise in a very different direction? It’s completely different, yeah. He’s a really talented writer and this movie has a lot of comedy in it and a lot of heart and drama as well. It’s a really tight script and they wanted to bring some other ’80s people on board like Michael Paré and Udo Kier and then they had a lot of comedians that they brought onto the movie too because they wanted to have some throwback flavour to it with some of us old people (laughs) but also to bring in some fresh, young comedians so it’s a good marriage of both I think. The script is evidence to that as well. 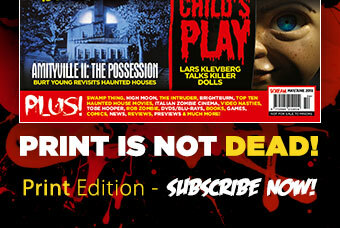 SCREAM: And can you spill the beans about your role in this one? I didn’t know whether they wanted people to know that my character is a tour guide and an ex-police officer but I think now it’s okay because they’ve said it was okay to post pictures of me in my uniform. I was part of the police crew that brought Andre Toulon down many years ago and then thirty years later, something is happening. There’s a convention and some puppet’s are going to be sold at this convention so a lot of people that bought puppets from Andre Toulon many years ago have come back to this first ever convention so all these people and all these puppets are brought together for the first time in a very long time and something happens. Obviously, I can’t say what happens but it’s very slyly written and there are a few different storylines going on and Craig has written a lot of really interesting characters that you care about so I’m really excited about that one too. 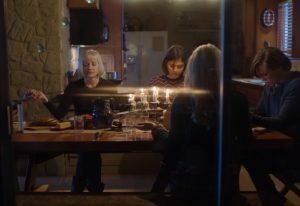 Don’t miss the American premiere of Replace as part of the Nightfall section of LA Film Festival on June 16 and we’ll leave you with the trailers for Replace and Applecart together with a video of Barbara Crampton’s adventures at this year’s Fant Bilbao Festival.